Looking for the best package deal you can find for your favorite team. Here at Easysportstickets.com you will be able to find 3 matches package deal for your favorite team playing in the Brazil World Cup 2014 .The 2014 FIFA World Cupt is scheduled to take place in Brazil from 12 June to 13 July 2014.FIFA World Cup 2014Tickets are in high demand as these International football matches are very popular. We only sell official World Cup 2014 tickets and we have the best prices on the market. We will deliver the World Cup tickets to your home or Hotel few days ahead of the event. Order now securely your World Cup 2014 3 matches package tickets and fulfill your dream of watching the World cup exciting games. Don’t miss out on being at the World Cup matches, buy now and secure your seats. The World Cup 2014 is a very special experience, come and join the passion and excitement at the stadiums. We will deliver your World Cup 2014 - Special Packages Tickets to your home or Hotel. Fulfill Your Dream of watching World Cup 2014 - Special Packages live. 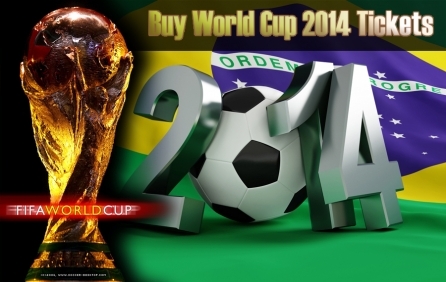 Best World Cup 2014 - Special Packages Ticket prices in the market guaranteed! We’re sorry, World Cup 2014 - Special Packages tickets are currently not available. Sign up for a World Cup 2014 - Special Packages tickets alert and we will let you know as soon as we have tickets available for sale. Please enter your email below for a World Cup 2014 - Special Packages updates! * You will receive World Cup 2014 - Special Packages email alert immediately once the tickets you're looking for become available. * Don’t Miss out the World Cup 2014 - Special Packages event.